Around the world, Nissan sells a small 5-door hatchback called the Note. The U.S. version is named the Versa Note. It replaces the previous Versa Hatchback. The 2014 Nissan Versa Note is sold in S, S Plus, and SV trim levels, the latter offered with option packages that upgrade the car to SL trim. Air conditioning, power mirrors, a tilt steering wheel, a trip computer, and a 4-speaker stereo with a CD player and an auxiliary audio input jack are standard equipment. Cloth seats and a 60/40-split folding rear seat are also included on the base model, which rolls on 15-inch wheels with plastic wheel covers. If you can’t shift your own gears using a clutch pedal and a 5-speed manual gearbox, you’ll need to upgrade to the Versa Note S Plus. It has a standard continuously variable transmission (CVT), plus cruise control and active grille shutters that help contribute to significantly better fuel economy. For power windows, power door locks, remote keyless entry, and Bluetooth, select the Versa Note SV. This model also gets better interior materials, a front center armrest, and a more comfortable driver’s seat adjustable for height. Three option packages are offered for the Versa Note SV. The Convenience Package adds a premium audio system, a reversing camera, and a Divide-N-Hide adjustable cargo floor. The SL Package adds to the Convenience Package with fog lights, aluminum wheels, heated front seats, and Nissan Intelligent Key with push-button starting. Either package is a prerequisite to the SL Tech Package. This upgrade installs a NissanConnect touchscreen infotainment system with navigation, real-time traffic and weather, Bluetooth streaming audio, Pandora compatibility, and a voice-activated hands-free text-messaging assistant. The SL Tech Package also has an AroundView monitoring system, heated side mirrors, and an Easy Fill Tire Alert system. In addition to these options, all three Versa Note models are offered with a variety of factory- and dealer-installed accessories. 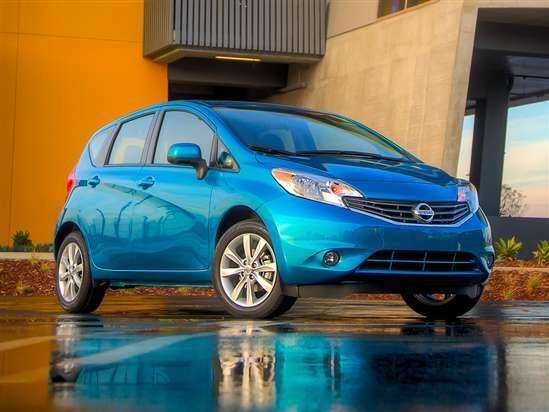 Nissan installs a 109-horsepower, 1.6-liter 4-cylinder engine in the new Versa Note. In S trim, it is paired exclusively to a 5-speed manual gearbox driving the front wheels. The S Plus and SV models get a standard CVT. Row your own gears in the Versa Note S, and you can expect 30 mpg in combined driving, according to the EPA. Get the CVT, and this car is rated to return 35 mpg in combined driving. Neither the National Highway Traffic Safety Administration (NHTSA) nor the Insurance Institute for Highway Safety (IIHS) had performed crash tests on the Versa Note as this summary was written. Providing the driver with a 360-degree view of the Versa Note and its surroundings, the optional AroundView Monitor is a rarity in any mainstream vehicle, let alone one at this price point. The Easy Fill Tire Alert system chirps the horn when inflating the tires to let the owner know the proper pressure has been reached.